Danze Oil Rubbed Bronze Lift & Turn Bath Tub Drain and Overflow Cover Plate Kit: This Danze Lift & Turn Bath Drain Conversion Kit is built to last. The highest quality standards are used to precision manufacturer a top of the line fixture. Important features of this 100% BRAND NEW Fixture: Complete Item! Everything necessary for installation is included. 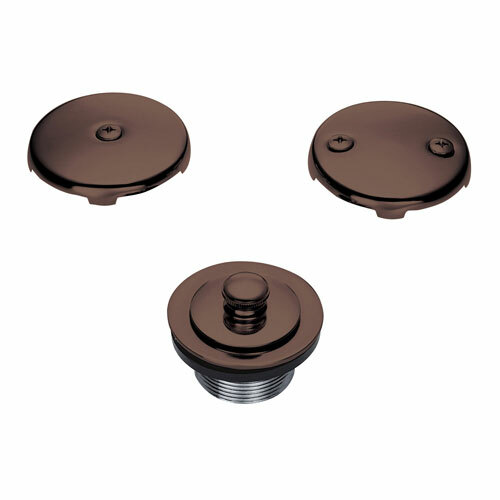 Oil Rubbed Bronze Lift and Turn Bathtub Drain Kit - Lift & Turn Bath Drain Conversion Kit - Easy to install - Matches Danze finishes - Oil Rubbed Bronze premier finish designed to resist fading and tarnishing. - Includes overflow trims-replace 1 or 2 hole overflow covers - Lift & turn tub drain - Matching Accessories Available - Easy to Install - Installation instructions included. This fixture is manufactured by Danze and is part of their Lift & Turn Bath Drain Conversion Kit collection.